Storms, Tornadoes Kill 2 In N.C.
A cluster of strong thunderstorms swept across central North Carolina early Saturday and spawned tornadoes, killing two people. A child was also missing. A woman was found dead in her wrecked home and her son was missing in the community of Kenly, which is about 35 miles southeast of Raleigh, said state police spokeswoman Patty McQuillan. The boy's father was taken to a hospital with injuries. In neighboring Johnston County, authorities said a child also was killed. Kenly suffered "complete devastation," resident Michael Barnes Sr. told CBS affiliate WRAL. "It looks like a war zone." Officials said the severe storm affected half a dozen counties, knocking down tress and power lines. 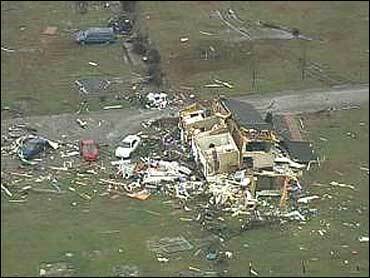 A number of homes and buildings were damaged or destroyed. WRAL reports tornado touch downs in Benson, Dunn, Elm City, Kenly, Lucama and Smithfield. The storm passed through Kenly, on the Johnston-Wilson county line, around 3:30 a.m. and through Wilson about a half-hour later. Kenly residents picked through the rubble of a one-story brick home that was devastated. Family and friends piled up mattresses, took pictures of the damage and filled garbage bags with trash. Family portraits had been tossed into the woods some 200 yards from the home. The skeleton of a camper the family had just bought rested nearby, amid other remnants thrown from the home. One half of Mark Stephenson's home was flattened, while a tree had fallen through other half, on top of his 19-year-old daughter's bedroom. She was taken to a hospital with non-life-threatening injuries. "It's hard to believe, it's hard to take in," Stephenson said. "We've got our lives and our health, so we're good to go." His 14-year-old son, Hunter, pointed over to what used to be his bedroom - now just a pile of bricks and beams. Hunter's bedroom was being remodeled and he had been sleeping in the living room. "I'm lucky," he said. "It's crazy, if I would have been in there, I would have been dead." Three homes away, Stacey Franks, 31, checked on her 78-year-old father. Two large trees had missed falling on his mobile home by a few feet. His tractor-trailer had been flipped on its side. "He's nerves are really damaged. He's just upset," Franks said of her father. "I just can't believe this has happened." Authorities did not immediately release the names or ages of those killed or injured. A Red Cross Shelter was opened at a church in Kenly. National Weather Service officials were sending crews out to survey the damage. The weakened storm system moved northeast to the Virginia coast. Blaes warned there was potential for another round of nasty weather along the Carolinas coast Saturday afternoon as a cold front crept across the region. Power outages affected more than 1,000 customers, primarily in Johnston, Wilson and Sampson counties, but Progress Energy crews had restored service to many customers, according to WRAL.